Caribbean Cinema Now, 6-2, 2015. L’of par onf.ca fabrication, valorisation et celebration du patrimoine à l’office national du film du Canada, 6-1, 2015. Terrorism and its Legacy in German Visual Culture, 5-2, 2014. Perceived Peripherality and Places Images: The City, the Region, the Border, 5-1, 2014. Media and Mothers’ Matters, 4-2, 2013. Scandals of Horror, 4-1, Summer 2013. Sighting Oil, 3-2, Fall 2012. Special Dossier: Stealing the Image, 3-1, Summer 2012. Wilson, Sheena, Adam Carlson and Imre Szeman, editors. Petrocultures: Oil, Politics, Culture. McGill-Queen’s University Press. 2017. Print. Wilson, Sheena and Diana Davidson, editors. Telling Truths: Storying Motherhood. Demeter Press. 2014. Print. Wilson, Sheena, editor. Joy Kogawa: Essays on Her Works. Guernica. 2011. Print. Chilewska, Anna and Sheena Wilson, editors. Writing After the Gaze: The Rupture of the Historical. Milan V. Dimič Institute for Comparative Literature & Cultural Studies. 2007. Print. Wilson, Sheena. “Energy Imaginaries: Feminist and Decolonial Futures.” Materialism and the Critique of Energy. Edited by Brent Ryan Bellamy and Jeff Diamanti. Chicago and Edmonton: MCMPrime Press. 2018. Pendakis, Andrew and Sheena Wilson. “The Nation Dreamt Whole: the NFB’s ‘—of Japanese Descent’” (1945) and Canadian Mid-Century Political Fantasy.” Topia: Canadian Journal of Cultural Studies, 37, Spring 2017, pp. 15-39. Wilson, Sheena. “New Stories, New Knowledge: Research Creation.” Petrocultures: Oil, Politics, Culture, edited by Sheena Wilson, Adam Carlson and Imre Szeman, McGill-Queen’s UP, 2017, Montreal, Quebec, pp. 477-479. Wilson, Sheena, Imre Szeman and Adam Carlson. 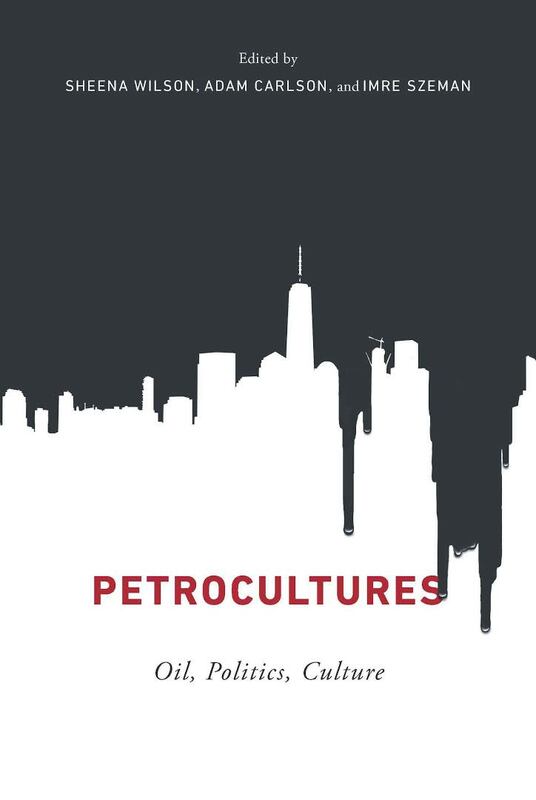 “On Petrocultures, Or Why We Need to Understand Oil to Understand Everything.” Petrocultures: Oil, Politics, Culture, edited by Sheena Wilson, Adam Carlson and Imre Szeman, McGill-Queen’s UP, 2017, Montreal, Quebec, pp. 3-20. Wilson, Sheena. “Gendering Oil: Tracing Western Petrosexual Relations.” Energy Humanities Reader. Edited by Dominic Boyer and Imre Szeman. John Hopkins University Press. 2017. Wilson, Sheena. “Gender.” Fueling Culture: Energy, History, Politics. Edited by Imre Szeman, Jennifer Wenzel, and Patricia Yaeger. New York: Fordham UP. 2017. Wilson, Sheena. “Petro-Mama: Mothering in a Crude World.” Telling Truths: Storying Motherhood, edited by Sheena Wilson and Diana Davidson, Demeter Press, 2014, Bradford, Ontario, pp. 307-314. Wilson, Sheena. “Obāchan’s Garden: Maternal Genealogies as Resistance in Canadian Experimental Documentary.” Screening Motherhood in Contemporary World Cinema, edited by Asma Sayed, Demeter Press, 2015, Bradford, Ontario, pp. 25-54. Anselmi, William and Sheena Wilson. “Technologies of Memory, Identity and Oblivion in Persepolis (2007) and Waltz with Bashir (2008).” Familiar and Foreign: Identity in Iranian Film and Literature, edited by Manijeh Manani and Veronica Thompson, Athabasca UP, 2015, Edmonton, Alberta, pp. 233-259. Wilson, Sheena. “Shake Up, Not Shake-Down: Comparative Literature as a Twenty-First Century Discipline.” Canadian Review of Comparative Literature, vol. 41, no. 2, 2014, pp. 226-229. Wilson, Sheena. “Recuperating Oblivion in The Displaced View (1988): Midi Onodera’s Intercultural Feminist Cinematic Experiment.” Regenerations/Régénérations: Canadian Women’s Writing/Écriture des femmes au Canada, edited by Marie Carrière and Patricia Demers, University of Alberta Press, 2014, Edmonton, Alberta, pp. 199-227. Wilson, Sheena. “Gendering Oil: Tracing Western Petro-Sexual Relations.” Oil Culture, edited by Daniel Worden and Ross Barrett, University of Minnesota Press, 2014, Minneapolis, Minnesota, pp. 244-266. Wilson, Sheena. “Networks of Relations: Introduction to Writing Motherhood.” Telling Truths: Storying Motherhood, edited by Sheena Wilson and Diana Davidson, Demeter Press, 2014, Bradford, Ontario, pp. 1-15. Wilson, Sheena. « Multiculturalisme et transculturalisme : ce que peut nous apprendre la revue ViceVersa (1983-1996). » Revue internationale d’études canadiennes, vol. 45-46, 2012, pp. 261-276. Anselmi, William and Sheena Wilson. “For your Glaze Only: Imperfect Divinity.” The International Journal of the Image, 1, no. 3, 2011, pp. 73-86. Wilson, Sheena. “The Multiple Voices of Poesis and Praxis: The Work of Joy Kogawa.” Joy Kogawa: Essays on Her Works, edited by Sheena Wilson, Guernica, 2011, Montreal Quebec, pp. 9-42. Anselmi, William and Sheena Wilson. “For Whom the post Tolls beyond Technologies of Feminism: Postmortem of Transnational Communicative Environments.” Critical Perspectives on Gender, special issue of the Journal of Critical Studies in Business and Society, special, vol. 1, no. 1-2, 2010, pp. 138-172. Anselmi, William and Sheena Wilson. “Terrorism Then and Now, Here and There: Canada, the Final Frontier.” Transplanting Canada: Seedlings / Transplanter le Canada, edited by Marie Carrière and Jerry White. Centre de littérature canadienne, 2010, Edmonton, Alberta, pp. 70-88. Wilson, Sheena. “The Bilingual Writing Centre/Centre d’écriture bilingue at U of A’s Campus Saint-Jean.” Writing Matters, edited by Betsy Sargent, vol. I, no. 2, Winter 2010, p. 2. Wilson, Sheena. “Campus Saint-Jean’s Bilingual Writing Centre: A Portal to Multiple Cultures and Cosmopolitanism Citizenship.” Canadian Writing Centres Association Newsletter, vol. 3, March 2009, pp. 9-12. Wilson, Sheena. “From Inch’Allah Dimanche to Sharia in Canada: Empire Management, Gender Representations, and Communication Strategies in the Twenty-First Century.” From Solidarity to Schisms: 9/11 and After in Fiction and Film from Outside the US, edited by Cara N. Cilano, Brill, 2009, New York City, New York, pp. 237-272. Wilson, Sheena and Anna Chilewska. “Introduction.” Writing After the Gaze: the Rupture of the Historical, edited by Sheena Wilson and Anna Chilewska. Milan V. Dimič Institute for Comparative Literature and Cultural Studies, 2007, Edmonton, Alberta, pp. x-xv. Wilson, Sheena and William Anselmi. “Where is the Frame in this Picture? Lest we Forget and the Conjurical Problem of History.” Canadian Review of East Asian Studies, vol. 2, no. 1, 2006, pp. 34-39. Wilson, Sheena. “Remembering: 1970s Narrativization of Japanese Canadian Internment in The Pierre Berton Show (CBC) and Enemy Alien (NFB).” Language Politics Culture, edited by Waclaw M. Osadnik and Piotr Fast. Wydawnictwo Wyzszej Szkoly Lingwistiycznej, 2004, Czestochowa, Poland, pp. 35-51. Wilson, Sheena. “It’s Telling: What Barbed Wire and Mandolins Does Not Say About Italian Canadian Internment.” Borderlines: Studies in Literature and Film, edited by Waclaw M. Osadnik and Andrezej Pitrus, Rabid Press, 2003, Krakow, Poland, pp. 177-200. Wilson, Sheena. “Kogawa, Joy.” Twentieth-Century World Fiction. The Encyclopedia of Twentieth-Century Fiction, volume edited by John Clement Ball, general editor Brian W. Shaffer, Wiley-Blackwell, 2011, pp. 1174-76. Wilson, Sheena. “Biography: A Narrative of Life through Words and Actions.” Joy Kogawa, edited by Sheena Wilson, Guernica, 340-351. Wilson, Sheena. “Awards and Honours Garnered for Obasan and for a Lifetime of Literary Work and Community Activism.” Joy Kogawa, edited by Sheena Wilson, Guernica, 352-354. Wilson, Sheena. “Bibliography: Works By and About Joy Kogawa.” Joy Kogawa, edited by Sheena Wilson, Guernica, pp. 359-362. Wilson, Sheena. “Bent Box.” The Encyclopedia of American Indian Literature, edited by Jennifer McClinton-Temple and Alan R. Velie, Fact On File, 2007, pp. 52-3. Wilson, Sheena. “Lee Maracle.” The Encyclopedia of American Indian Literature, edited by Jennifer McClinton-Temple and Alan R. Velie, Fact On File, 2007, pp. 220-222. Wilson, Sheena. “Sojourner’s Truth.” The Encyclopedia of American Indian Literature, edited by Jennifer McClinton-Temple and Alan R. Velie, Fact On File, 2007, pp. 330-331. Wilson, Sheena. “Sundogs.” The Encyclopedia of American Indian Literature, edited by Jennifer McClinton-Temple and Alan R. Velie, Fact On File, 2007, pp. 348-49. Wilson, Sheena. “Holly Uyemoto.” The Encyclopedia of Asian American Literature, edited by Seiwoong Oh, Fact On File, 2007, pp. 302-303. Wilson, Sheena. “Kerri Sakamoto.” The Encyclopedia of Asian American Literature, edited by Seiwoong Oh, Fact On File, 2007, pp. 259-260. Wilson, Sheena. “One Hundred Million Hearts.” The Encyclopedia of Asian American Literature, edited by Seiwoong Oh, Fact On File, 2007, pp. 229-230. Wilson, Sheena. “Antony Thomas.” Encyclopedia of the Documentary Film, edited by Ian Aitken, United States: Routledge, 2005, pp. 1316-1317.